For a destination wedding hearing a bride say, “I really want creative and artistic pictures of my wedding and I love black and white” is like music to my wedding photographer ears. When my bride just gives me the green light, I feel like I have complete permission to work directly from my heart and soul – and that is when we will get the best images. 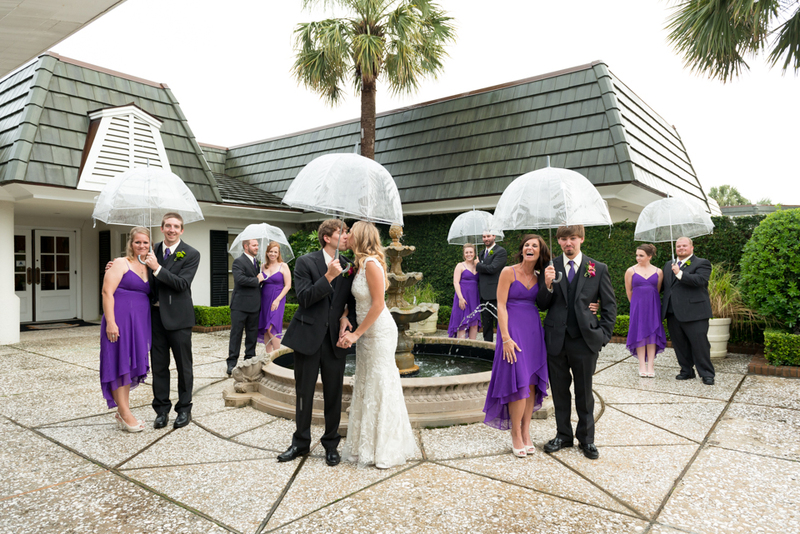 Holly wanted to put a new spin on vintage southern charm with her destination wedding venue, Olivers Lodge, in Murrells Inlet was the perfect place to be able to capture the essence of her vision. The “charm” of the inlet is felt by all who are there. The big old oak trees along the marsh creates a rustic yet whimsical feel – and was just perfect for what Holly was envisioning for her day. The week before the wedding I found myself glued to the weather channel website on my iPad. It felt as though there was just rain all around us and I am not a religious type of guy, but for my brides I will ALWAYS pray, hope and if necessary beg for nice weather. It seemed as though our prayers were heard and the sky took a break for long enough for Holly and Stephen to say their “i-do’s.” and an enjoy an evening with friends under the stars. The bride had suggested that her brother would be quite emotional and maybe we could show an image of him and the grooms sister struggling to let go…and this is what we got, a couple of fun loving jokesters. My favorite destination wedding image of the day…This was the fastest cake smash I have ever seen and after 200+ weddings I have seen a few. Holly totally took him by surprise before he had even finished cutting out the slice of cake. I love a good cake smash, just ask my wife (she started it).